​We are currently raising money to assist the community, schools, and local businesses to learn and practice Mindfulness Base Stress Reduction (MSBR). ​The MBSR program helps us become more aware of these habitual reactions and helps us relate to ourselves in a new way to interrupt this cycle and create more choice in life. Maybe upon reflection we realize that reacting to the guy who cut us off that way only increased our stress and didn't make a difference to the other driver, maybe even just angering him more. So in the future we become more aware of this reaction by noticing our hands white knuckling the steering wheel or heart racing alerting us to the stress reaction occurring. In that moment we are present and are sitting in that space between stimulus and response. We then choose to take a few deep breaths, let our shoulders relax a bit, and even consider the unpleasant state the other driver must be in to be driving that way. Maybe we even wish him well, because if he was, he wouldn't be driving that way. Candi's yoga has been a great addition to the programming here at the Martin Girls Academy. 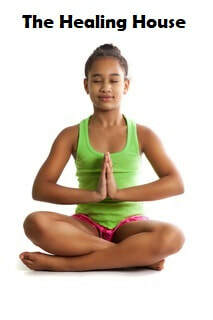 From Ms. Candi's yoga the girls use yoga as a healthy way to cope with stress and other mental diagnosis. The girls love Ms. Candice and are also asking for her to come back. Yoga with Candi is something special. Candi has a fun, energetic & warm personality She shares practical life lessons with her practitioners. Her classes are invigorating and challenging in a good way, helping you find your breath and inner-self. I feel renewed when I leave her classes and I highly recommend you treat yourself to the experience. Candi's yoga has helped my body become stronger in mind, body and soul. Its very refreshing to have such a relaxing session after a long week. Not only do I enjoy being on the beach but she's a wonderful instructor. Candi's meditation has given my children new ways to face challenges in their day to day life. We are practicing lion's breath and a "peace begins with me mantra." My husband says it's helpful to have the whole family doing something consistent and our children will benefit! Thank you Candi McCoy for all you have done for me and my son! I started earlier this year with yoga and meditation and I surely can say it changed my life! My son was struggling in school and home , he had really hard time to focus and concentrate, after few times of medication he started being calmer and focused in school , his grades positively changed in the last few weeks through the mediation and he seems to be happier than he was before. I'm very happy that we have the opportunity to learn that kind of lifestyle ❤️.